One of the longest associations I have in the music business is with conguero Eddie Montalvo. I first met Eddie in 1976 when he was working with the band Los Kimbos. During this era of the 1970s and 1980s, Eddie recorded with so many great Salsa artists including the legendary Hector Lavoe. He was always a part of the recording efforts that came from my basement studio. The most notable of these was Drum Solos Vol. I, II and II from which countless percussionists world-wide learned to play tumbao and to solo. A concept that was given new life, some 25 years later, when a dvd was created using 15 of the finest percussionists in the world and of course featuring this rhythm master, Eddie Montalvo. 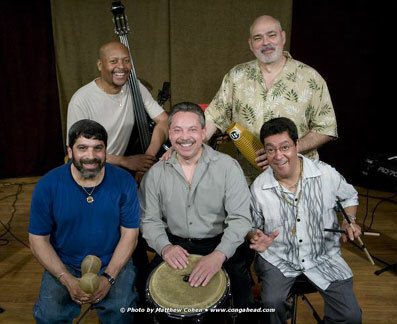 Along with Eddie were Gilbert "El Pulpo" Colon Jr. on keyboard who was on the first Drum Solos recordings, Louis Bazo on bongos, Nicky Marrero on timbales, and Ray Martinez on bass.